Minnie Renshaw, who lives in the Orchard, Honeyknab Lane, Oxton. 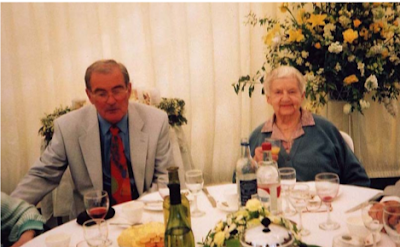 “I was born in 1916 at Skye Breck on the Salterford Road, Blidworth Bottoms. Dad was the farmer there. Grandma lived at Salterford House and of course all the family was within ten minutes. [I went to school at] Blidworth. Dorothy [sister] was [there] of course and then Horace, brother. Leslie was only a day old when Mum died, but fortunately grandma took control and then when she died, another auntie took him under her wing, but we haven’t got him now. I’m the only one left out of four”. “[We came to Oxton in] 1931, to Keepers Cottage on Beanford Lane. I was at work then, at 15 I was working in Nottingham at Goodlads, he was a box maker and a printer. The boss invited me to join the office staff and [I] worked there twenty three years. We used to catch the eight o’clock bus in the morning but of course sometimes if it was too bad we couldn’t. We walked three times”. “In the war, where the road comes down to meet Oxton Road, [there] was a camp. The soldiers were there, [with] search lights. Uncle was in the Home Guard and he used to leave auntie and me [to] fend for ourselves best we could and with the help of God we saw it through”. “I was drafted to Pearson Brothers during the war and then I was drafted from Pearson’s down to the Royal Ordnance Factory at Kings Meadow, and I did thirty-four years there. I [was] presented to the Duke of Edinburgh on the last year I was there. We worked three years at Ruddington as well and I was travelling into Nottingham then catching a bus from the Victoria Centre to Ruddington. It was a filling factory [for bombs]. We weren’t on that side of it, we were on the Ministry of Supply, but all to do with the war of course. All weathers, you were expected to get there, it was only illness that kept you away from it. You were drafted here and there to different departments where needed, but I was in control of the accounting machines”. 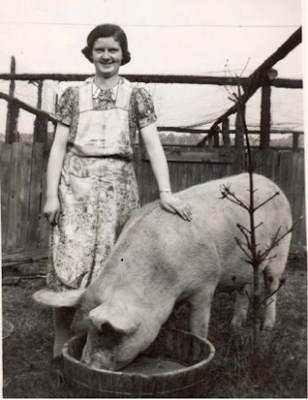 “Dorothy was cook for the Land Army at Hockerton. In 1941, when we had all that heavy snow, and they didn’t get any transport backwards and forwards, they all had to hike it if they wanted to get anywhere. She didn’t get down here very often of course. When she retired she came to live with us”. “We used to go to whist drives, when I was old enough. Uncle taught me to play whist. Uncle and I used to go to the Palais, marvellous prizes they used to get there during the war time. Ah those were the days. Aunty was a dressmaker, that was her trade. She taught me a lot of it, embroidery and knitting, that was your pastime, and a game of dominoes. We used to go to dances at night, it would be early hours you were still enjoying yourselves, you didn’t bother about the time. [There were] flags up [in the Memorial Hall] and decorated up sort of thing, but [in] that little tin hut we used to have whist drives and dances there, oh yes, yes, they used to have some lovely things”. “I used to know me way around [the Hall] as well as I knew my own home, because uncle was game keeper to them, and I used to go regularly with him when Lord Charles came there. I often used to walk down with him and wander out into the garden and Mrs Holehouse, Gladys, was his cook. Her husband was in the war, they had one daughter, Margery [later married Percy Cooper]. Lord Charles gave a garden party one particular time. Stan Taylor was on the money kiosk, you went in for a small donation. [Lord Charles] used to say ‘now pick what you like within certain pathways, but don’t do any damage, just pick what flowers you’d like’.